A Rivers state High Court on Friday granted the National Chairman of the Peoples Democratic Party, PDP, Prince Uche Secondus leave to issue a writ of summons to Minister of Information, Lai Mohammed and the federal Government. River state Chief Judge, Justice A. I . Iyayi- Lamikanra, who presided, also granted that the defendants be served by substituted means all the originating processes together with accompanying processes in Thisday newspaper. The case was adjourned to Monday April 23, 2018. 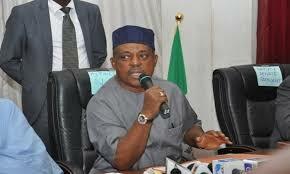 The Minister had mentioned Secondus in the list of those he claimed looted the nation’s treasury, alleging that he collected N200m from the former National Security Adviser, NSA. Secondus in the suit no/PHC/1013/2018 is claiming that Lai Mohammad’s publication is defammatory and is asking the court to direct him to retract the said publication and apologize in writing. Secondus is also asking the court for a perpetual injunction restraining the defendant from further publishing defammatory materials against him. Joined in the suit are the federal Government of Nigeria, through the Attorney General of the federation.